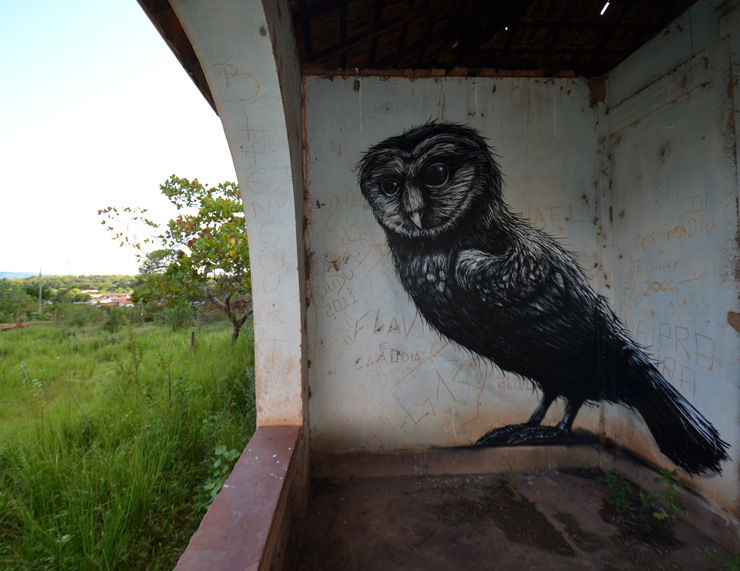 We check in today with the ever evolving itinerary of the singularly nomadic street art urban naturalist named ROA. 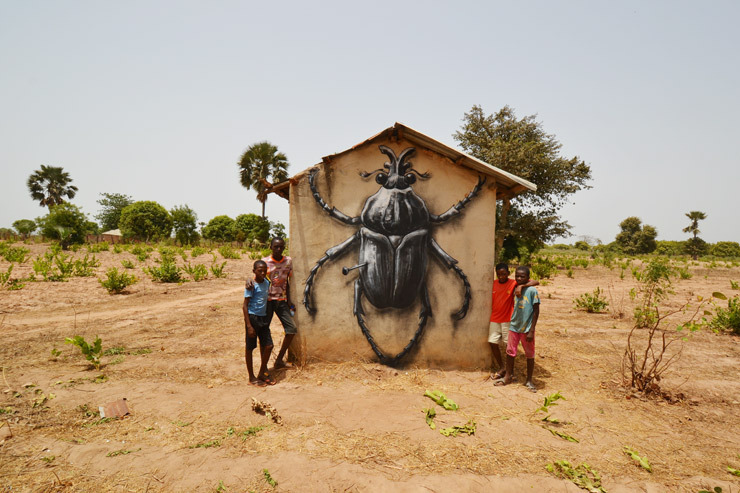 The well known and respected aerosol painter hails from Ghent in Belgium but he is rarely there these days, so busy is he introducing his monochromatic pictorials of the marginalized animal world. 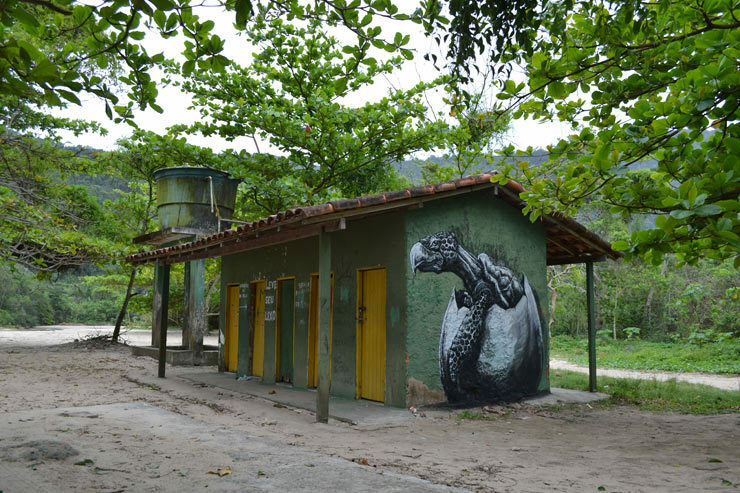 Despite the immense variety of his subjects that are reflective of the local population, ROA's style is unmistakeable, as is his choice of difficult and imperfect surfaces on which to paint. 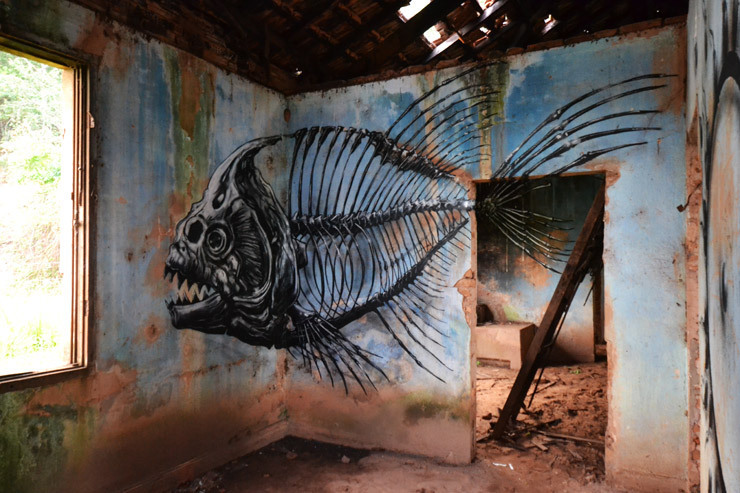 Some times his subject is playful or alert, other times they are in a struggle, still others are dead or dessicated; paying full respect to the cycle of life and death. 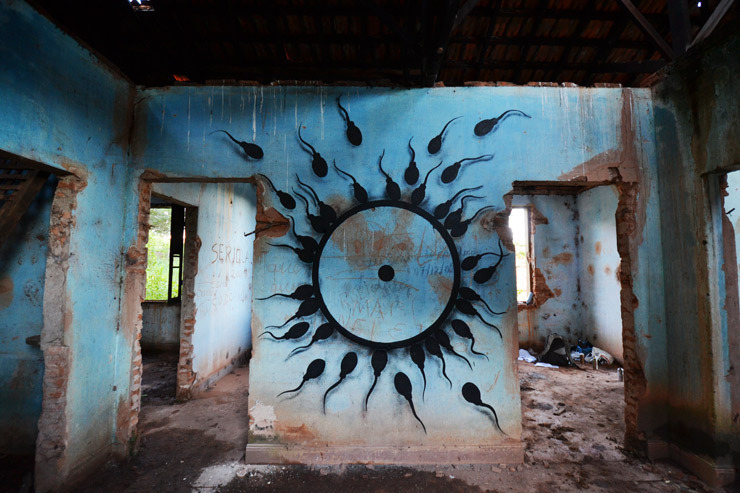 As if to remind us of our own sorry impact, once in a while they are ensnared and suffering in our unthinking detritus. 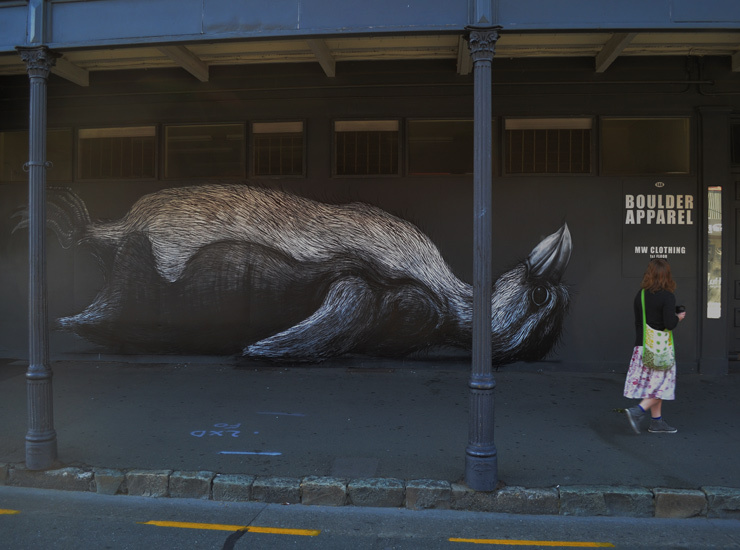 Not surprisingly, a number of the animals are endangered and his painting can often take on an environmental advocacy as a result. 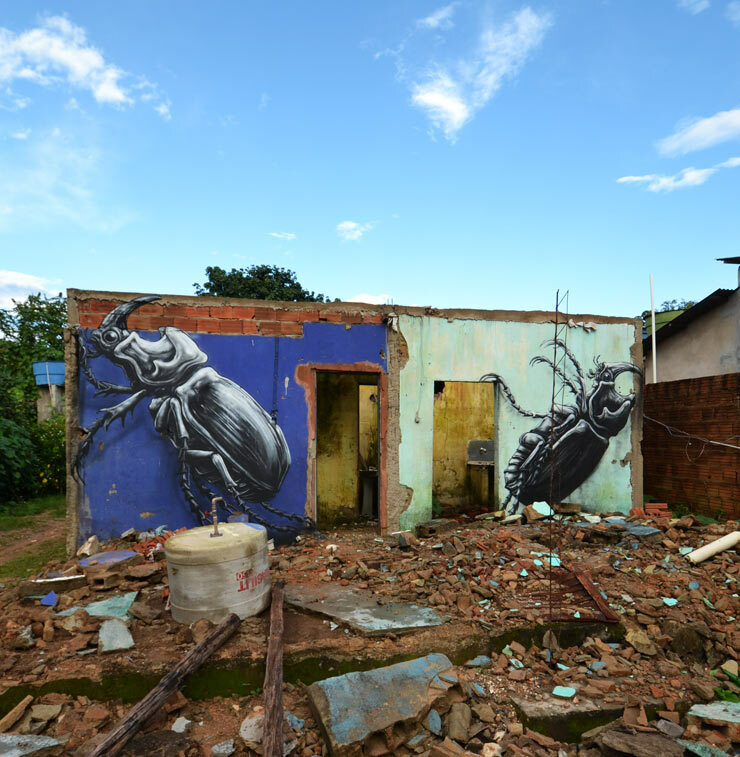 Here we travel with ROA through six countries to see where he has been painting and to learn a little about the environment that these new stars of the street have debuted upon. 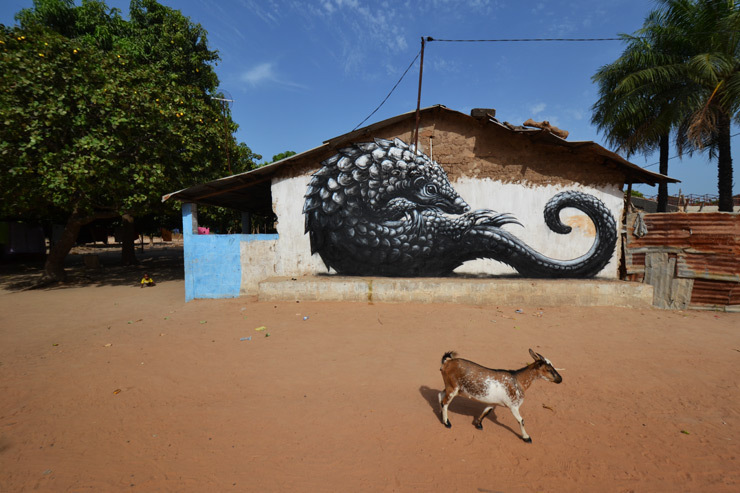 On his third visit to The Gambia for the WOW festival, ROA had the opportunity to paint a yellow caterpillar, a flying serpent, the Pinned Scarabée and some pangolins in the villages of Kembujeh and Galloya. He says, "I will be back, it's amazing" and would like to thank all the folks who live in those villages as well as the organizer of WOW, Lawrence. 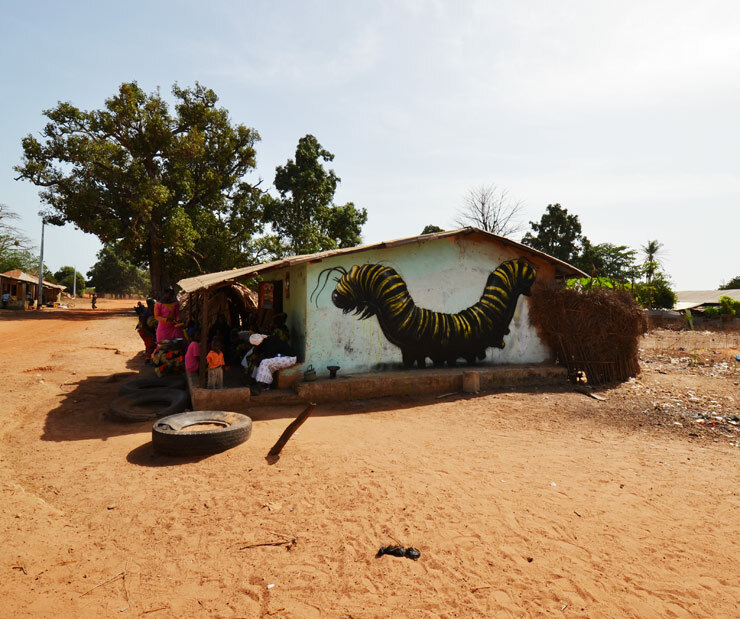 "I've painted a pangolin before in The Gambia but being back there and having read so much during the past year about the illegal trafficking of pangolins - to be served as exotic food or mostly as a 'medicine', I needed to paint them again. 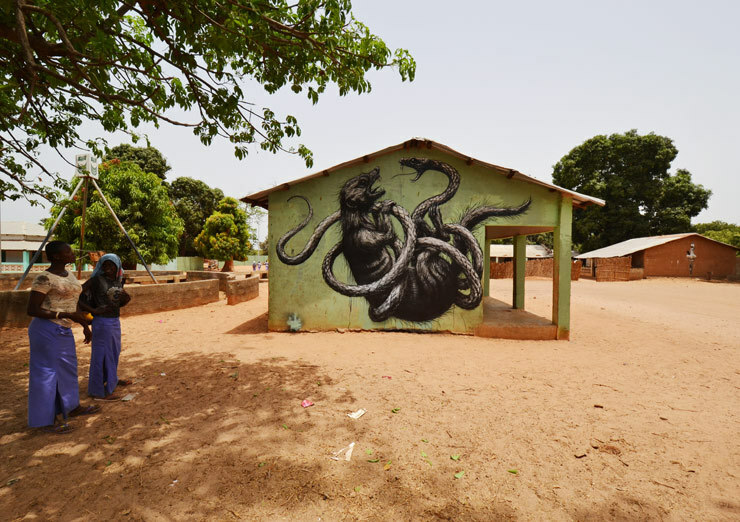 Firstly, the so-called medical qualities of the ground-up scales are disputed and "the animals are currently on the list of endangered species because of the trafficking and the loss of habitat by deforestation in Africa," explains ROA. He notes that one of their attempts to protect themselves is to reconfigure their appearance. 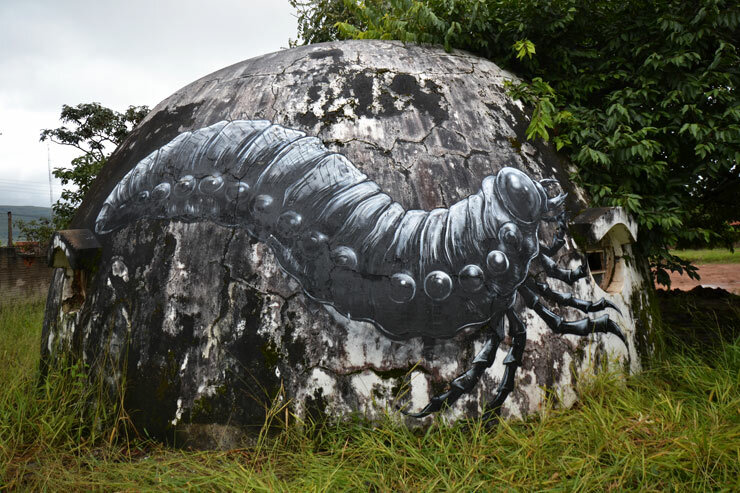 "They can roll up into a ball to defend themselves," he says. 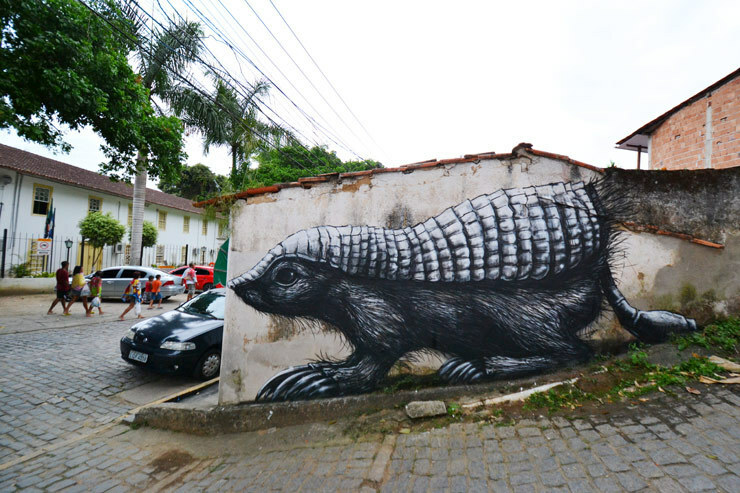 In the past few months ROA has been to Brazil twice, and neither time to see the World Cup. 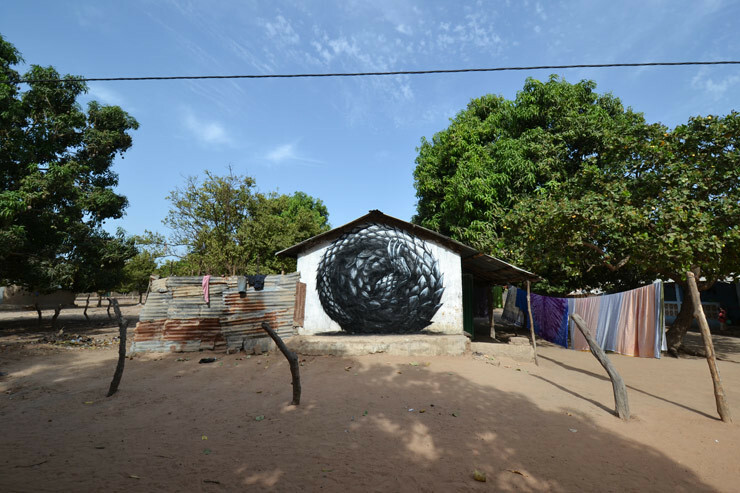 Instead he has been backpacking around and doing "many small interventions in between beautiful beaches." 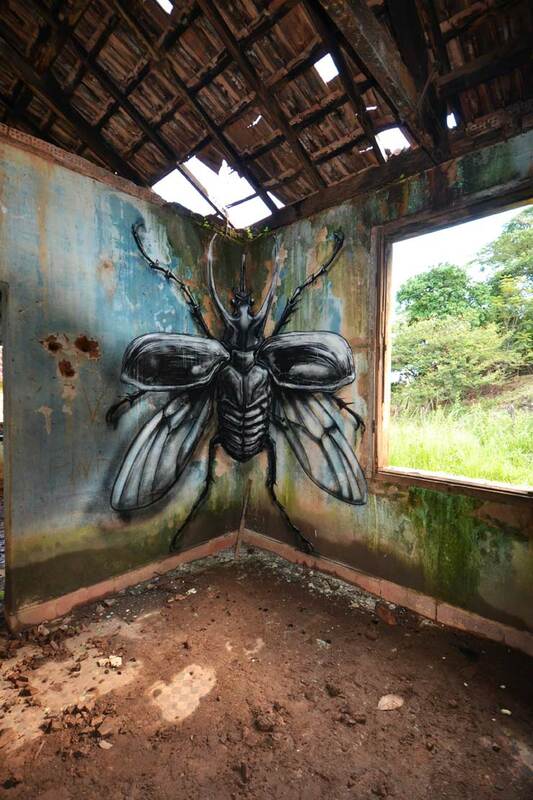 While the insects in some of these paintings are originally small, their final scale on the walls are definitely not. 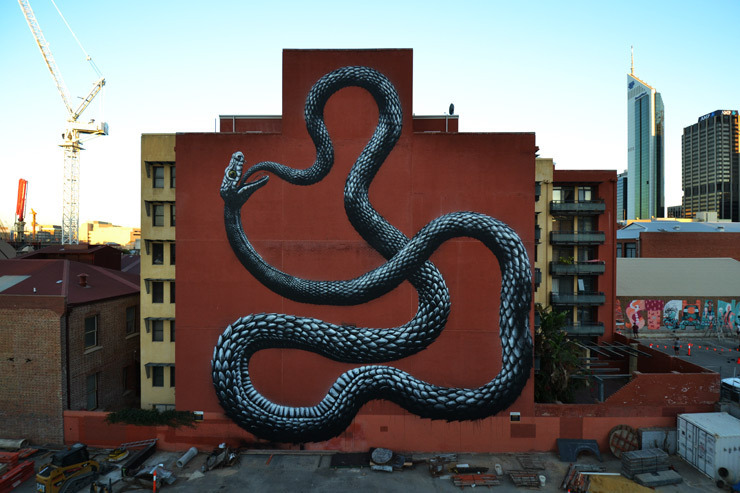 While participating in Form's PUBLIC festival, ROA painted a serpent eating his own tail; a design that refers to ouroboros, an ancient mythological symbol. 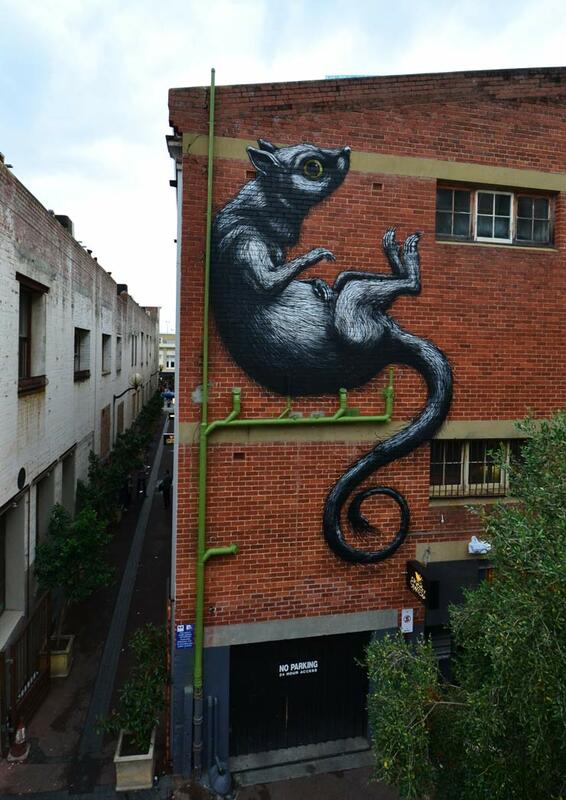 He says that Australian aboriginal people believe "the serpent has a great symbolic value as 'The Rainbow Serpent.' ". While painting the facade of the Canterbury Museum in Christchurch for the RISE festival, ROA decided to mix the dead with the living - "It's a MOA skeleton with a kiwi!" he says. He explains that the moa was native to New Zealand, and flightless (like the kiwi), but the moa died out after humans settled the region. 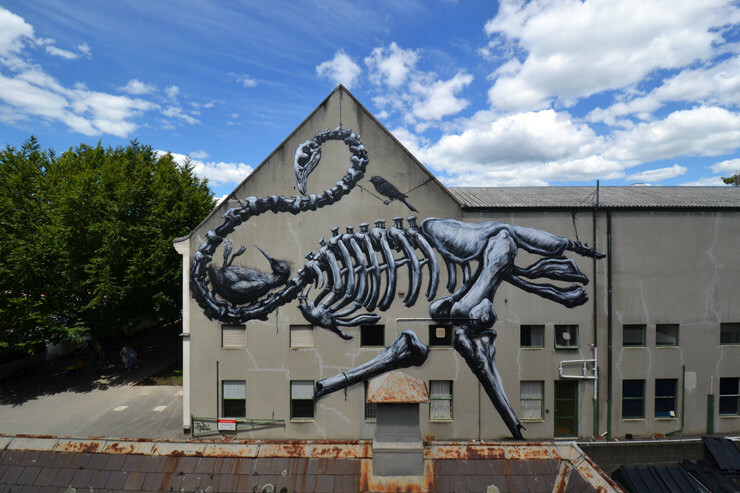 In fact the Canterbury museum has a large collection of moa bones and skeletons and ROA understands that the museum is said to swap bones with other natural history museums to enlarge their own varied and large collection. 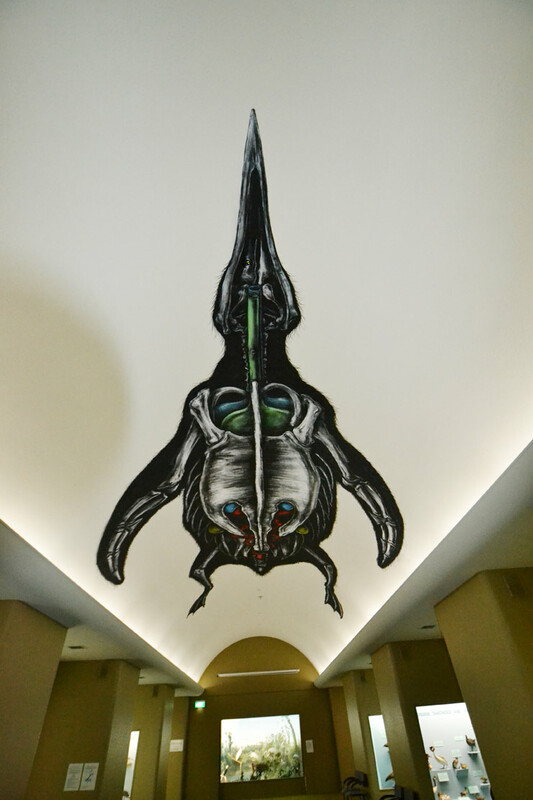 One legend, according to the artist, "goes that they swapped some moa bones for the mummy they exhibit. 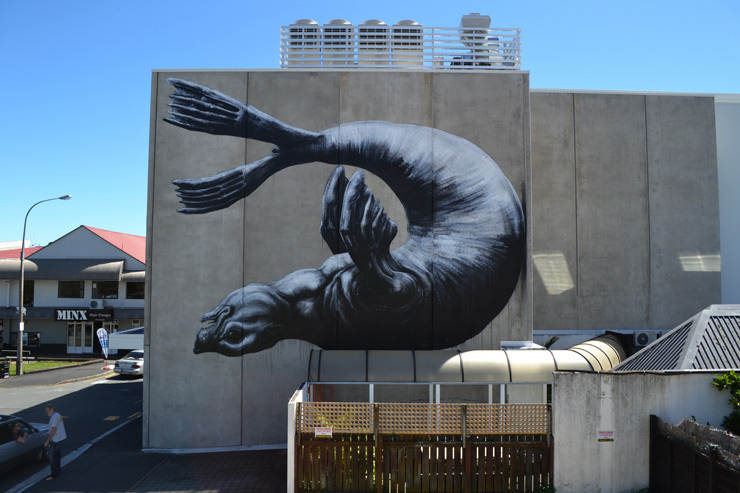 The site of the painting here has particular significance to the people of Christchurch as only a few years ago in 2010 and 2011 the city suffered serious and damaging earthquakes and almost 200 people died near here. 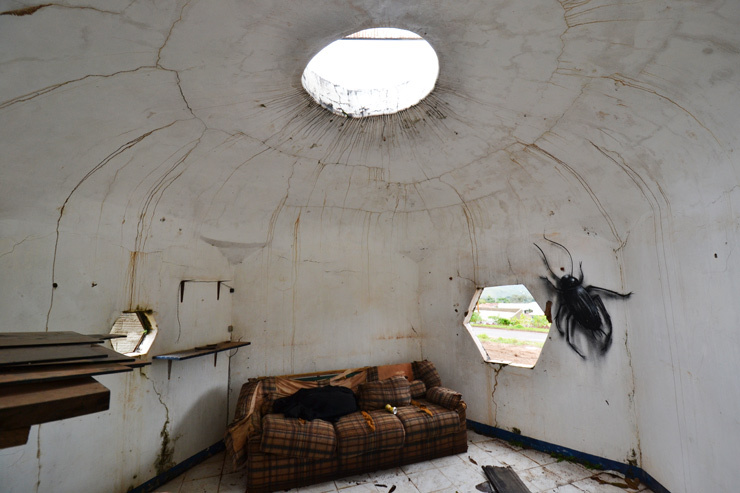 The actual museum was well protected, but many buildings were heavily damaged and survivors still speak "about post-eartquake times, characterized by change and more social awareness," he says, making this museum, "a very special place to be." 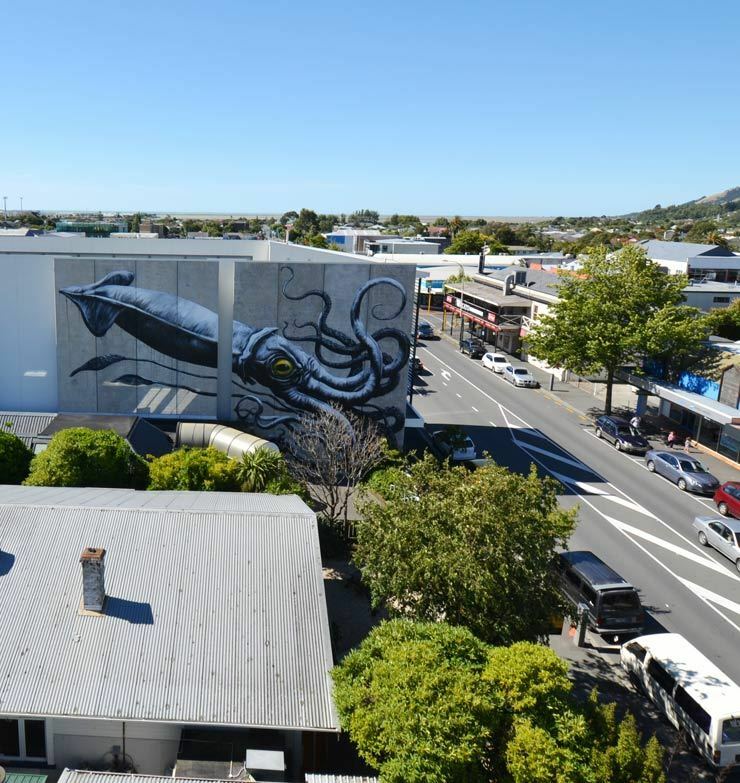 Roa would like to extend his thanks to Eelco and Ali from The Free House, as well as George and Shannon for his time in Nelson. 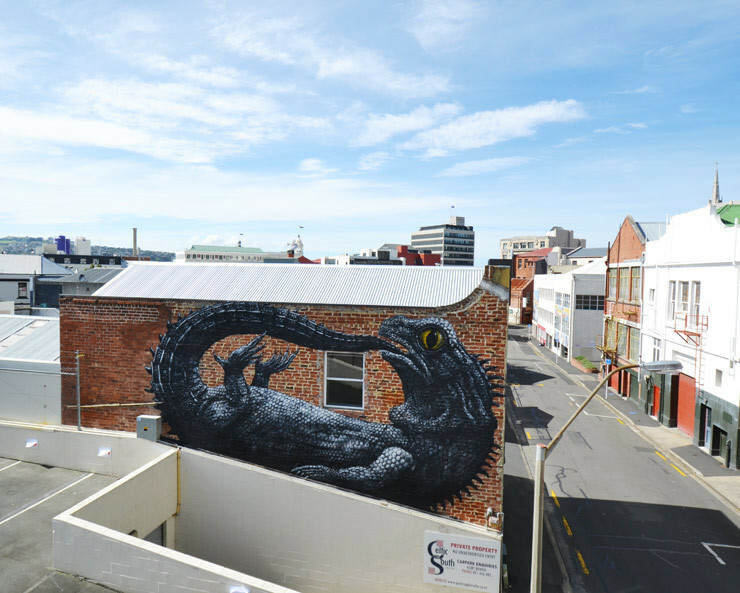 "I painted a tuatara in Dunedin," he says, of the indigenous reptile. ROA would like to say thanks to Justin and Luke for their hospitality. 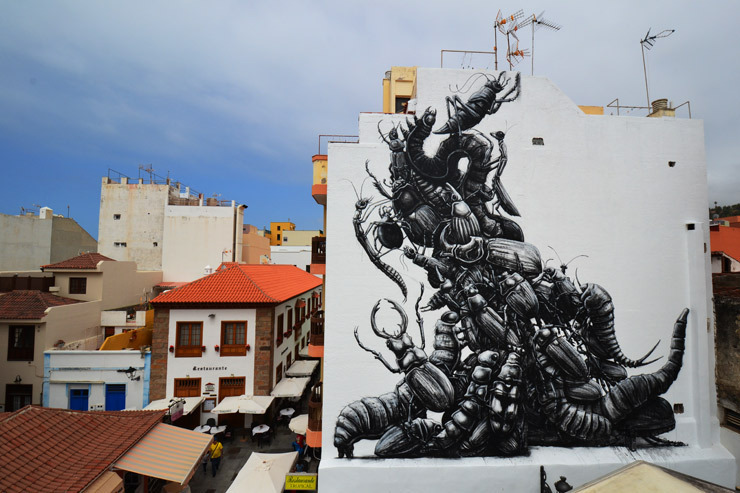 "At the invitation of the MUECA festival in Puerto de La Cruz, I painted my first large scale insect wall!" exclaims ROA, who looks for ways to keep challenging himself. He says that this was a composition that included, "Lots of different little creatures to paint," which was rather demanding, but he didn't mind too much because, "it was a beautiful environment and atmosphere." 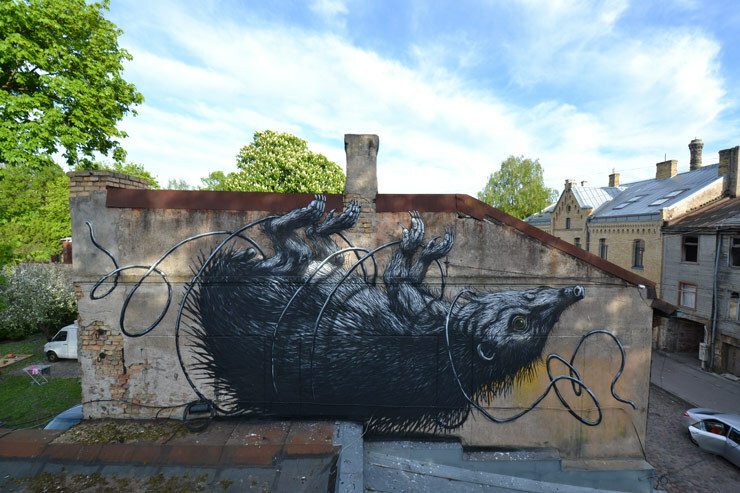 There was a lot of bad weather in Riga during the Blank Canvas festival that ROA participated in, but "I got to paint the hedgehog and hopefully I will be back there soon to paint more," he remarks. 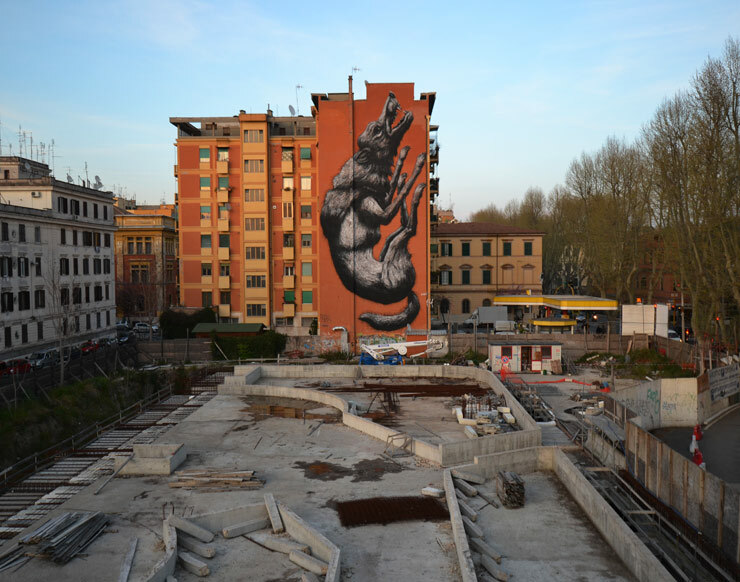 Finally, we end our tour with ROA in the famous city of Rome, where he visited for the very first time. 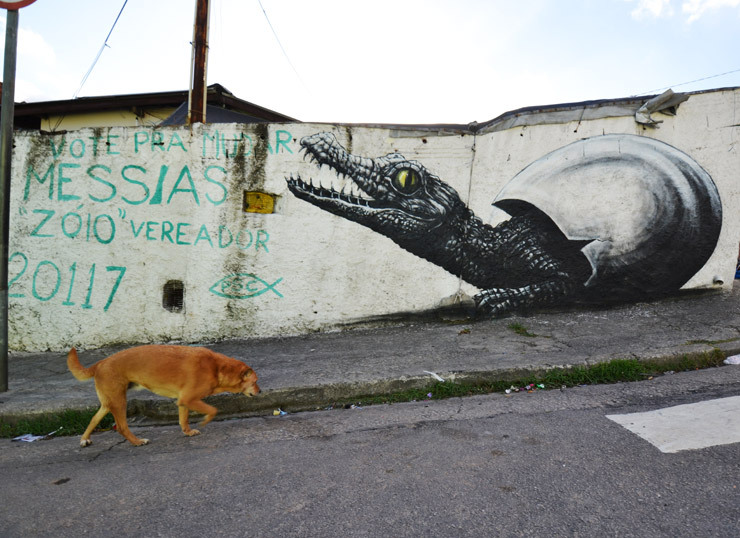 He says that it is a "wonderful city" and he painted this wolf "referencing the legend of the founding of the city." 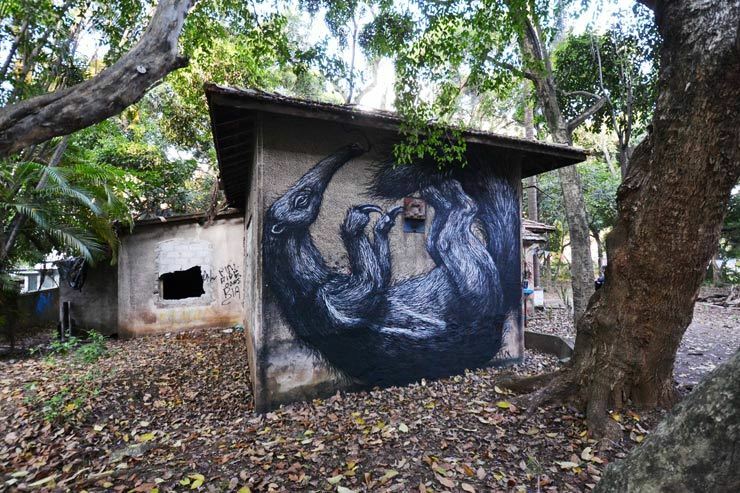 Roa extends his thanks to Stefano and Francesca of 999 in Rome.